Grand Café asparagus salad: Zuckerman Farms asparagus, carrot soubise, goat cheese vinaigrette, radish. Photo: © tablehopper.com. 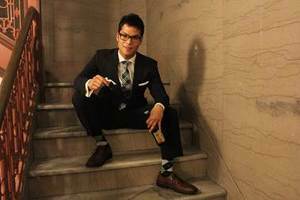 Sommelier Josiah Baldivino; photo courtesy of MICHAEL MINA. I think you’ll like the sound of this: for the month of May, ~GRAND CAFÉ~ is going to offer half off all bottles of wine. Yup, even sparkling. The only limitation is a cap of two bottles of wine per table. Have fun! 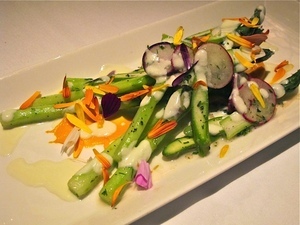 And don’t miss chef Alicia Jenish’s asparagus salad with goat cheese vinaigrette—it’s deeeelicious. Starting this evening, ~RISTOBAR~ is offering a special wine list on Tuesdays that they’re calling 15/30, which means the restaurant is offering 15 select wines at $30 per bottle. Tonight’s list includes selections like 2009 Castello di Luzzano, “Carlino” Oltrepó Pavese Bonarda; 2010 Cantine di Dolianova, Vermentino di Sardegna; 2006 Malvira, Langhe Nebbiolo; and 2008 Poliziano, Rosso di Montepulciano. The next time you head to ~MICHAEL MINA~ for dinner (or a drink at the bar), take a look at sommelier Josiah Baldivino’s new monthly wine feature, Hometown Heroes, which will spotlight notable wineries that have done something exceptional to define the wine industry in California. You’ll be able to access highly sought-after old and rare vintages from the cellars of wineries like Copain Wines in May, Corison Winery in June, and Peay Vineyards in July. There will be a white and red wine-by-the-glass offering from each winery, along with a vertical series of coveted library wines. The new sign at the former Kimo’s. Photo by Rebecca Kinney. © tablehopper.com. 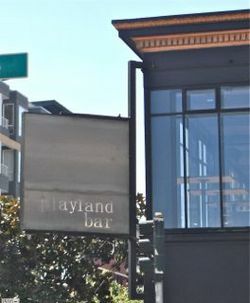 After Kimo’s, the two-level dive bar and live music spot on Polk Street, closed on New Year’s Eve, it looks like the new incarnation will be ~PLAYLAND BAR~. The owners haven’t returned our calls, so that’s all we’ve got right now: a sign. And a veiled reference to San Francisco’s Playland at the Beach. In the meantime, you can read some of Kimo’s back story in this piece by the SF Weekly from last year. 1351 Polk St. at Pine. And the next time you swing by ~SPRUCE~, be sure to congratulate their new lead sommelier Chris Gaither on his recent accomplishment: he passed the Court of Master Sommelier’s Level III: Advanced Examination. Considering fewer than 400 people in the world have passed the exam, it’s very cheers-worthy. Step Right Up to the Sideshow Saloon! 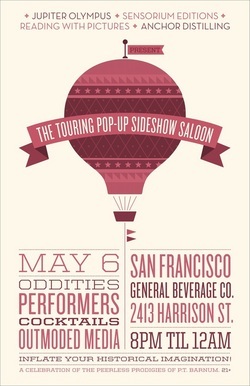 Jupiter Olympus and friends are bringing ~THE TOURING POP-UP SIDESHOW SALOON~ to San Francisco on Sunday May 6th. Enjoy the saloon-inspired party and sideshow attractions (à la the 1850s) for free with RSVP. You’ll still wanna hit the ATM for the cash bar ‘cause the Jupiter Olympus mixologists will create a cocktail menu with spirits provided by Anchor Distilling Company, including vintage cocktails made with a hand-cranked Imperial cocktail shaker. The Sideshow Saloon party is bringing a P.T. Barnum theme: look for trapeze artists performing overhead, oddities, curious mechanisms, maybe even a mermaid, plus photographic projections and live piano music. The event also celebrates the launch of The Peerless Prodigies of P.T. Barnum, a graphic novel by media historian Jillian Lerner, who will be signing. Proceeds will be donated to Reading With Pictures, a not-for-profit organization that gets comics into schools and schools into comics. 8pm-12am. 21+ only. Victorian costumes encouraged. RSVP online. General Beverage Co., 2413 Harrison St. at 20th St.